Each of us want to achieve so many things in life. Sometimes thing happen effortlessly, sometimes with struggle, sometimes even after so much effort, it just doesn’t seem to move. Have we ever thought why? Is it how it is meant to be? Or just that you have not put the effort in the right direction? How do you know? Is it your bad luck that you couldn’t achieve what you want? Or is it that someone else is stopping it? How can you break the barriers and achieve what you want in life? Sanatana Hindu Dharma has the science of manifest your reality and our beloved Swamiji, H. H. Parmahamsa Nithyananda has made it into an easy-to-practise technique. This powerful technique of manifesting your reality is taught in this program, so you can apply this technique to manifest whatever reality you want. 2What are the benefits of the program? This program is about identifying the barriers that stop you from manifesting your reality, a powerful technique to overcome those barriers, so you can manifest the reality you want to cause for yourself. - Chronic diseases are miraculously healed. 3How will your life be after the program? Any reality that is not manifesting in your life, you will know how you are stopping from manifesting that reality, how you can break the barrier yourself, so that reality will start manifesting in your life. 4What are the upcoming dates for this program? 5What is the cost of the program and how can I pay? The program is offered completely free of cost, for humanity to benefit from this great science of manifesting your reality. 6Once I pay for the program, what is my next step? This program is offered completely free of cost. Once you register, you will receive a link to a consent and release form, filling which, you will receive 2-way login details for the program. 7Where can I attend this program? Can I attend this program from my own house? Link to 2-way satsang centers with their contact numbers. This program happens only on 2-way video conferencing. It is offered absolutely free of cost. When you do the program via 2-way video conferencing, you can attend the program but you will not be receiving the Shiva deeksha. If you are attending this program via 2-way video conferencing, you will be receiving swamiji’s initiation into the extraordinary shaktis as explained above. 8Who is eligible to attend this program? Is this open for all? Is there any age limit to attend this program? This program is open to public. Anyone can attend this program. There is no age limit for the program. 9What is the dress code for the program? Attending the program via 2-way at your own house or at a center, please wear white clothes. 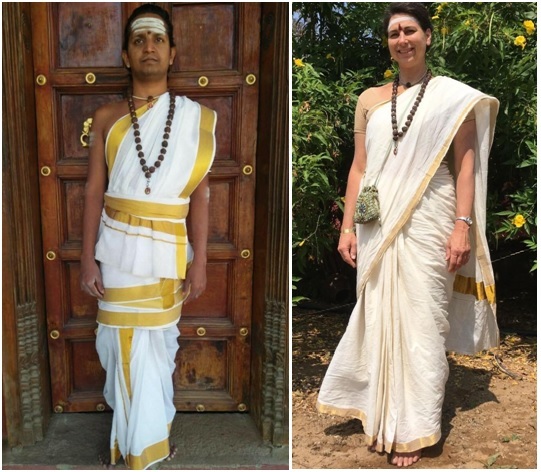 Agamic attire for men: White dhoti tied as yogavastram, white dhoti as devagacham, white dhoti as hip cloth. (White dhoti shld have golden bonder only – no other color border). Agamic attire for women: White cotton saree with golden border. 10What is the next step after attending the program? You can choose to do the Nithya Dhyan Yoga (level 1) , Nithya Kriya Yoga (level 2), Nithyanandam (level 3) or directly choose to do Inner Awakening or Mahasadashivoham.